The BIMO program is designed to allow students to explore living systems in molecular terms. While chemistry is concerned with the relationship between molecular structure and reactions, and biology focuses on cells and organisms, biochemistry and molecular biology probe the details of the structures and interactions of molecules in living systems in order to provide the foundation for a better understanding of biological molecules both individually and as members of more complex structures. 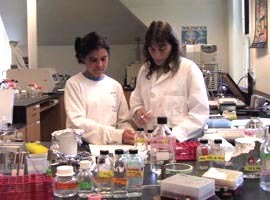 The program has been structured to provide students the necessary background in biology and chemistry, a solid introduction to biochemistry and molecular biology (through BIMO 321 and 322), and the opportunity, through a wide choice of electives, to explore many areas of modern molecular biology and biochemistry.